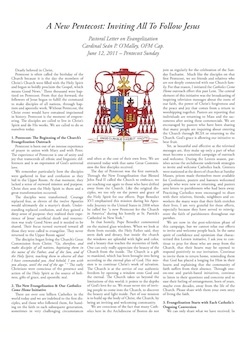 Parishes may wish to order printed copies of Cardinal Seán’s Letter for their parishioners. It is available in three languages: English, Spanish, and Portuguese, as well as in a 4-page version and an 8-page, large-print version. If you wish to order both sizes or multiple languages, please choose the quanity and language, click “Add to Cart” and then on the shopping cart, click on “Return to Shopping” to come back to this page and make another selection.